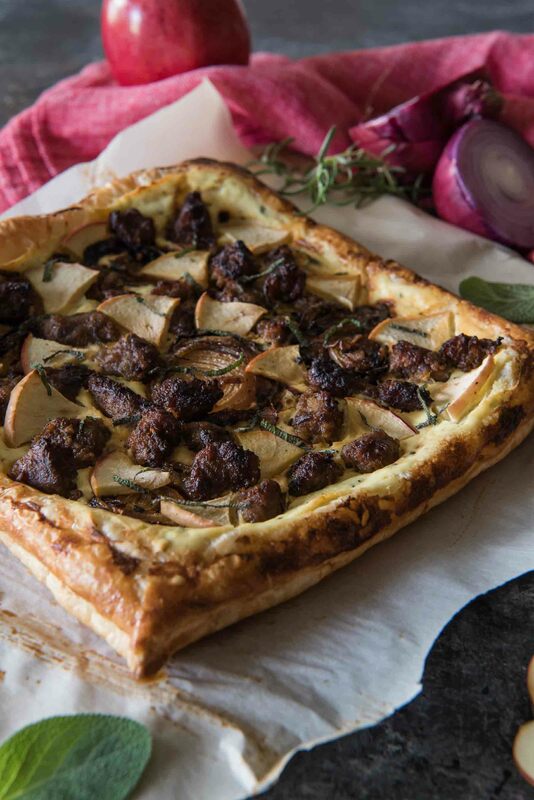 Caramelized onions, spicy Italian sausage, and sweet apple on an herbed ricotta, spread over puff pastry – whether served as an appetizer or snack, this Savory Apple Sausage Tart is sure to please any fall flavor-loving crowd! Autumn is here! It’s time to live your best life in fuzzy sweaters by cozy fires with hot toddies in hand. Just know that there are a ton more fall goodies coming your way in the next few months! 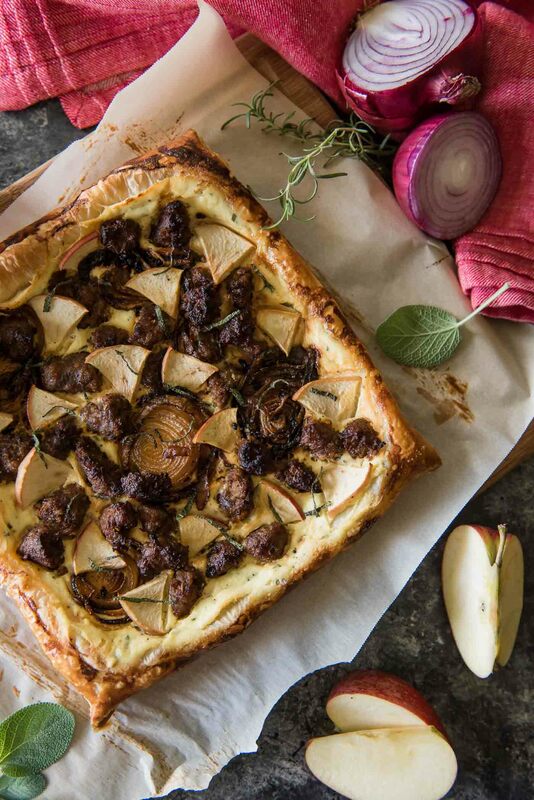 We’re kicking it all off with Apple Week, and I’m still drooling over this Savory Apple Sausage Tart I made you guys. Crispy and creamy, sweet and spicy, herbaceous and comforting. I don’t know about you, but this is the kind of food I want to eat every day until 2018. JUST TAKE ME TO THE SAVORY APPLE SAUSAGE TART ALREADY! If you’d rather skip my (pretty darn helpful) tips and tricks, essential cooking info, and similar recipe ideas – and get straight to this deliciously easy apple tart recipe, just scroll right on down to the bottom of the page where you can find the printable recipe card! This here tart is a pizza-pastry lovechild, full of flavors I never appreciated until young adulthood. My Nana was an amazing cook and baker, but she mostly stuck to flavors that were in her Polish wheelhouse – caraway, sauerkraut, cabbage. Minimal seasoning. Polish cooking is delicious and very likely traditionally full of all kinds of fats and salty flavor…but I wouldn’t know for sure. She had to amend the way she used salt due to my Papa’s heart disease. This recipe also goes light on salt, but it makes up for it with all kinds of fat and oil-sauteed goodness and herbs out the wazzoo. Combined with the fresh apples, it’s a warm and homey app and will happily sit on your fall menu in the weeks to come. LOOKING FOR MORE SAVORY FALL RECIPES? 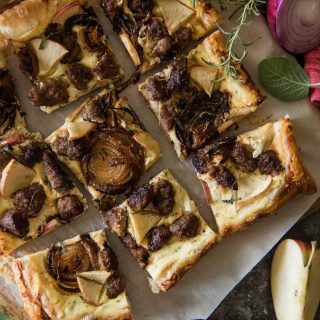 Caramelized onions, spicy Italian sausage, and sweet apple on an herbed ricotta, spread over puff pastry - whether served as an appetizer or snack, this Savory Apple Sausage Tart is sure to please any fall flavor-loving crowd! Unfold the pastry sheet on the parchment. Lightly score the edges with a knife, leaving about a 1/2-inch border around the square. Brush the edges with the beaten egg, then set the egg aside. Prick the center of the pastry thoroughly with a fork, then refrigerate until ready to use. In a skillet set over medium heat, cook the sausage until it's just browned throughout, about 5 minutes. Remove sausage from skillet but retain half of the grease. Reduce heat to medium-low, then add the butter and oil to the skillet and swirl. When melted and shimmering, caramelize the onion rounds for about 8 minutes on each side until they're a dark golden brown. In a medium bowl, combine remaining egg, ricotta cheese, thyme, rosemary, 1/2 tablespoon of the sage, and salt and pepper to taste. Mix until combined. Remove pastry from refrigerator. Spread ricotta mixture on top within the 1/2-inch border. Top with caramelized onions, sliced apples, and cooked sausage. Bake for 18-20 minutes, until the outer edge of the pastry is golden brown and cooked through. Garnish with remaining fresh sage when ready to serve. 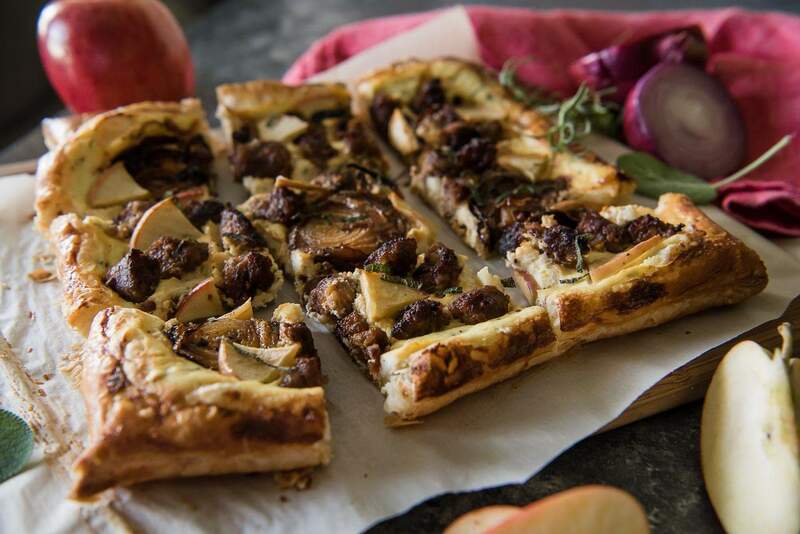 Check out these other delicious #AppleWeek recipes! Torta di Mele Sicilian Apple Cake from Girl AbroadPIN THIS SAVORY APPLE TART FOR LATER! This appeals to me on so many different levels. This looks so good! It is beautiful and I already know it tastes amazing as well! What a great way to kick off AppleWeek! This looks so elegant and perfect to share with some girlfriends! I love how you talk about your Nana and her influence on this dish. It looks amazing and sophisticated but unfussy! This would be nice for a harvest party or Thanksgiving appetizer. I love anything with puff pastry! Love the sweet and savory combination!! 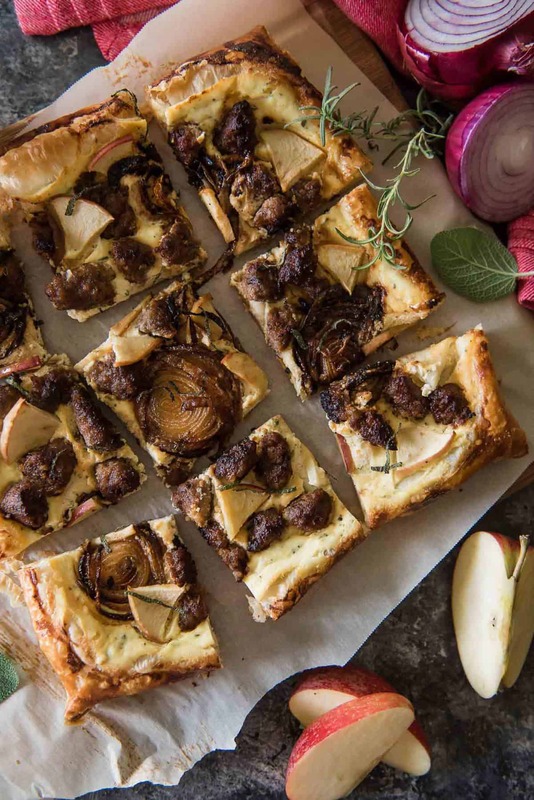 Sounds like a delicious combination, and love it being on puff pastry so nice and easy too! Every time I see these pics, I think of hosting my girlfriends for brunch this fall. Looks like the perfect light meal to pair with friends, wine and chatting.